Redruth head coach Steve Larkins is delighted with his side's attacking flair after their second bonus-point win put them top of National Two South. The Reds scored four tries as they beat Southend 30-17 to become the only side in the division to take maximum points from their first two games. 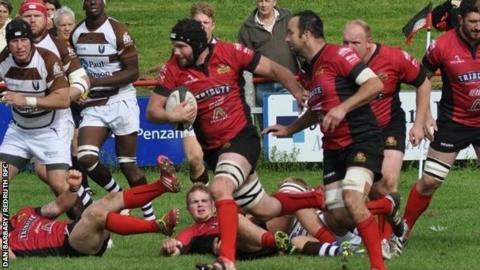 "We're trying to play an exciting brand of rugby down at Redruth and it's showing at the moment, " he said. "We've got 10 points from 10 and scored some exceptional tries." Larkins felt the margin of victory could have been even greater if his side had not lost their discipline and had four players sent to the sin bin during the match. "If we could have kept our 15 players on for the entire game, we could have put another 10 or 15 points on them," he told BBC Radio Cornwall. "But if we can win and be entertaining at the same time it's only going to encourage people to come and watch Redruth play. "There's a very good atmosphere here and if we can keep winning it'll encourage more people to come and watch us."